I skimmed this book as part of my research for a paper and presentation about teaching “at-risk” students in secondary schools. 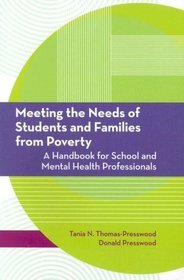 This book is a winner because it covers a vast array of topics regarding the effects of poverty and what various school professionals can do. What I didn’t like was the lack of specific suggestions for teachers. Instead, most of the content was researched-based summaries of problems and rather vague solutions but without clear instructions on how to reach those solutions. But the book was written for a wide audience, and it’s a good starting place for someone researching poverty’s effect on students. challenge students – always! Watered-down curriculum isn’t the solution.